Alayna is using Smore newsletters to spread the word online. 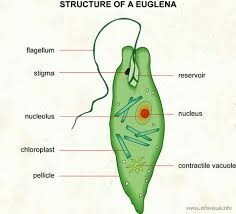 The euglena have chloroplast that they use to make their food by photosynthesis. They normally live in puddles or small ponds. To move they use a flagellum which is a whip- like structure that is located at the front end. To reproduce it splits it self in half but it can't do that if it doesn't have food. If there is no light around then the euglena can swim around and prey on smaller organisms. They swim around using chloroplast to make food and reproduce when it gets to the right temperature. 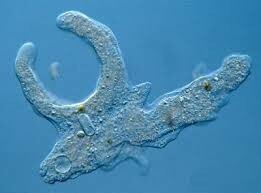 The amoeba feeds on algae, bacteria, plant cells, and microscopic protozoa and metazoa. They move by changing the shape of their body, forming pseudopods. They reproduce by having one of the parent cells split the nucleus and then it produces two smaller copies of itself. This process is called binary fission. As they swim around, water from the environment enters the cell through the membrane and when too much water enters the contractile vacuole spits it back out. 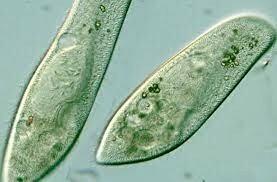 Paramecium feed on microorganisms such as yeasts, algae, and bacteria. They ca reproduce both sexually and asexually. They mainly use asexually which is when they split them selves in half. They move by using cilia which are hair-like structures. They also use the cilia to sweep food into the cells mouth and falls into the oral groove. These cells are unique because they live as algae in the colony. They use chlorophyll to make their food by photosynthesis. 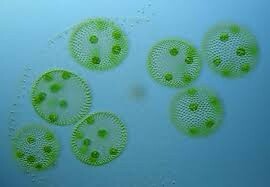 Each volvox has two flagella that they use to move by having them beat together to roll through the water. When the daughter colonies mature, to reproduce the parents burst open releasing the daughter colonies.